Our ‘Farmhouse,’ made since 2000 at our cider orchard in Lebanon, NH, is in the cans and moving gracefully to market in our home state, NH, plus MA, NY, & probably NJ so far. It’s a small release, because on Farnum Hill we’re nervous Nellies. If it works once we’ll do it again bigger! The 2017-crop ‘Farmhouse’ tastes orchard-delicious* - and just not sweet. Please serve at 55-65F — not ice cold. ** “Serve Ice Cold,” also means “Kill The Taste.” Just saying. There are big differences between cider-grown & table-grown apples. Some of the best cider apples taste weird or horrible if you bite them. Plus they seldom look flawless, and they almost never crunch. Also, they’re very scarce here in the U.S., so not many American ciders can be called "CiderGrown." Four-pack of 12-oz cans, brimming with the good stuff. Besides the right varieties, apple-crazy makers like us want the ripest possible fruit – packed with fermentable sugar, saturated in the exotic aromas and flavors of each variety. Crunchy apples haven't fully ripened, so they don't cut it. Some cider apples reach their best when they're dropping from the trees. In cider lingo, there are four types of cider fruit: “bittersweets” high in tannins and sugar; "bittersharps" high in tannin & acid; “sharps” high in acid; and “sweets” high in sugar. There are hundreds of cider varieties, grown the world around. Unlike grape wines, most of the best-made ciders contain juice from several different varieties. Sharpest of sharps: tiny Wickson apples meet a sunbeam on their way to the press. Wickson juice lights up cider blends with floral aromas, fruity flavors - and the keenest, cleanest acid. 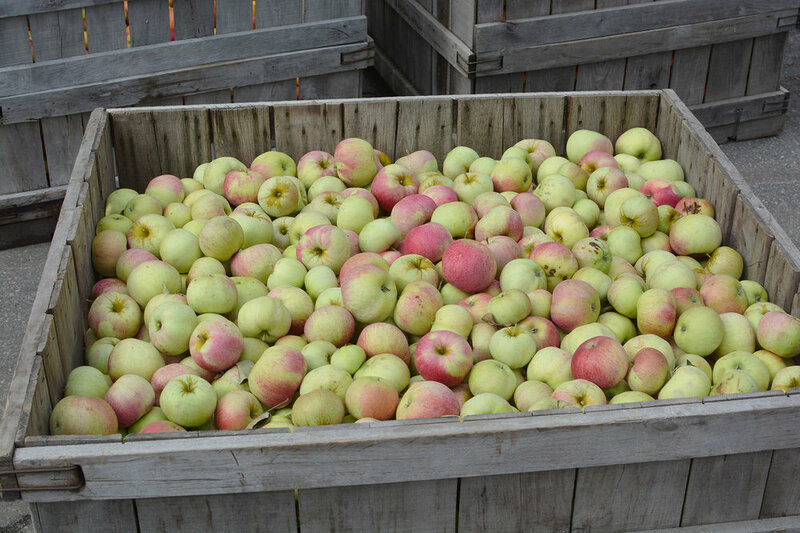 When cider-grown apples come in to the press, they bring their own character plus something of the soils and weather of the orchard where they grew, and something of one year's growing season. Each cider-grown batch offers singular flavors and aromas, formed in certain orchards in certain seasons, never again exactly the same. 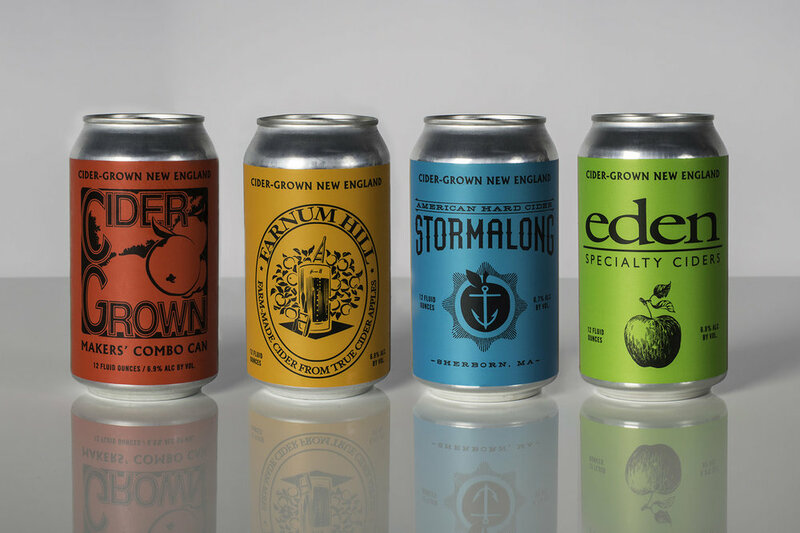 In 2017, three orchard cider-makers released the colorful four-pack seen below. Now very hard to find, this little quartet preaches the CiderGrown sermon - without the bother of words. Cider apples rule, so our cider-grown ciders take patience. We all press our apples as soon as possible after harvest - not after long storage. But after that, if you visit us, you'll see we each work differently. Which is no surprise once you taste our different ciders. We each have favorite cider varieties, depending on who we are, where we are, and the flavors we prize most. We have different views about fermentation. Cider -making and wine-making basically work the same: start with great fruit, strive for great fermented beverage. Makers in both fields get delicious results while disagreeing about the how-tos. We all 3 have websites where you can find more details. Besides apple-worship, we have habits in common. Repeated, intensive tasting of tank and barrel samples. Constant experimentation. Fear of messing up a truly complicated process. Many kinds of tanks, various shapes and sizes, various materials. We each use barrels differently, for different reasons. There are more CiderGrown makers around. We hope to produce future interesting 4-packs that showcase different makers with the same attitude. Cider explorers! Your comments and suggestions would be welcome.